The government then returned the herds to the wild with significantly less genetic variation than it needs to survive, Front Range claims, in violation of the Wild Horse Act. And the government secured paid adoptions for the valuable horses it kept, according to the lawsuit. PORTLAND, Ore. (CN) – Horse lovers’ claims that the government’s genetic manipulation threatens the survival of wild horses may be fatally marred by a nonprofit’s assertion that it’s spending its limited resources on lawsuits to halt the program. Front Range Equine Rescue sued the BLM and the Interior Board of Land Appeals in January 2016, accusing the government of rounding up the Kiger and Riddle Management herds in eastern Oregon and removing horses that did not display particular traits of the original Spanish mustang – traits for which the two herds are known and highly valued. 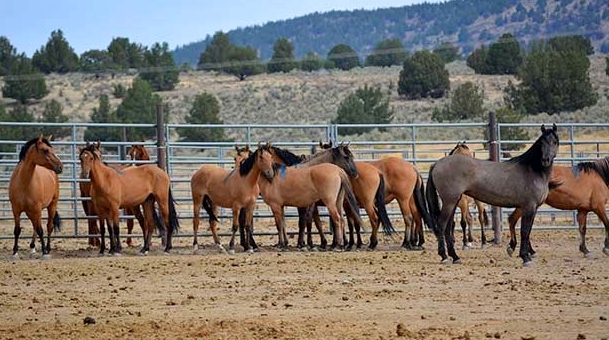 “By intentionally reducing the diversity of wild horses in the Kiger and Riddle Mountain HMAs [herd management areas] to only those horses with Kiger characteristics, and then conducting gathers every four years to further empty the gene pool and round up these valuable Kiger horses to sell them for adoption, BLM has effectively created a breeding facility that injures the natural herds’ survival possibilities and benefits only BLM and private actors desirous of purchasing this ‘breed,’” the lawsuit states. Attorneys for Front Range Equine Rescue sparred with their counterparts for the BLM in Federal Court on Wednesday over competing motions to dismiss. Arguing for the government, Kaitlyn Poirier told U.S. District Judge John V. Acosta he should toss the case because Front Range has not shown it was harmed by the government’s breeding program. To prove standing to sue, Poirier said, Front Range had to show the government’s action harmed its ability to carry out its mission. She said they could not do that because fighting the government on behalf of wild horses is part of its mission. Bruce Wagman, attorney for Front Range, countered that the organization was not founded to bring legal challenges. Its main mission is to provide wild horse rescue services, build corrals and open horse rescue farms. But when it found out about the government’s plan, it devoted a portion of its normal resources to investigating whether it harmed the Kiger and Riddle Management herds, and later to litigating the issue, Wagman said. Acosta did not indicate when he would rule.